Today many small, medium and large organizations are moving from various platforms to SharePoint online. Either few are moving from Lotus Notes to SharePoint or from various old versions SharePoint (MOSS 2007 / SharePoint 2010 / SharePoint 2013) versions to SharePoint Online. And almost every organization uses Calendar to see a group or personal meetings and events. The default Office 365 calendar not provides all necessary features according to a business requirement. VirtoSoftware designed a very useful Office 365 Calendar, through which you can keep track of all your events, meetings, tasks, appointments and holidays from various SharePoint lists in a single color-coded Office365 calendar. 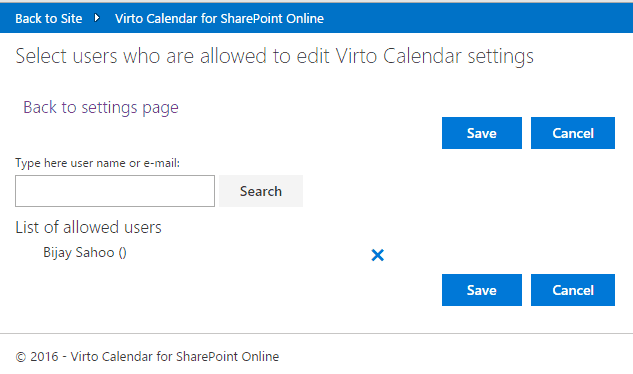 How to Configure Virto SharePoint Online Calendar? It will display data from multiple SharePoint lists of any type and Microsoft Exchange Calendar. Apart from default views like Day, Month, Year, it also has other views like Week, Workweek, Task (Days), and Task (Hours), Multi-source and Gantt chart views. You can overlay calendars from different data sources and choose color for each data source. Very simple and easy to use interface, where you can add an event with one mouse click, change event duration with a simple resizing option, move event date/time to new event date/time by simply drag and drop, open by one click add/edit forms. The licensing options are per user based and if your organization has 251 to 500 users then the price will be $0.99 per user per month. You can check out more licensing option on product site. If you want to check all the features, you just need to add the app from Office 365 Calendar product page with 30 days free trial. Click on the settings icon to add a data source (SharePoint list of any type). The beauty of Office 365 Calendar Add-in is the simple options, a very simple settings page with few links. We will go through each link and explain how to customize this calendar. But first, we will create a data source, which we will display in the Office 365 calendar. I have my IT calendar, which I will add as a data source to Virto calendar. Go to the Settings page of Virto Office 365 Calendar add-in, then click on “Create Data Source” Link, and give a name to a new data source. Then select list, I have chosen the “MyITCalendar” list. It also has the option of selecting the view and field for event title from the list. It has another feature of choosing the event background color. I want my IT events to appear in green. Similarly, I will follow the same steps and add another list as a data source to the Office 365 Calendar add-in. The list is a task list and I want the background color to appear as yellow. Apart from default lists like calendar or tasks list, Virto Office 365 Calendar has an option to show event details from custom lists as well. Here in this particular example, we have a holiday calendar list (custom list) which we have added as a data source. Below is a screenshot how it looks as a new data source list. Now if you will see on the data source page, all our data sources are there. If you want to edit or remove a data source, you can click on the title to edit or delete button to delete the data source. Now it is time to create the calendar and then add the data sources to the calendar. Go to Office 365 Calendar settings page and click on “Available Calendars”, you will be able to see an option “Create New”. Click on the link to create a new calendar. Give a name to a new calendar, choose the default view for this calendar and also there are few custom options. The other important thing on this page is an ability to select several data sources. See an example below. Also, I can add my Exchange Calendar to this Calendar just by checking one box, only one single click needed! After Saving if you will open the Office365 Calendar add-in, it will display like below. My Calendar list data is showing in green color, my custom list “Leaves” list data is showing in purple color and my task list is appearing in yellow color. In this Office 365 Calendar, you do not need to go to the source list to edit/delete an item from list. Another unique feature of this SharePoint Online Calendar is that you can create an event directly from this calendar. Simple click on somewhere in the calendar and then it will pop up a dialog box with Title and an option into which calendar you want to insert. This fields of creating form are also customizable. This is a great feature if you need to manage different source from the same place. A user can take advantages of drag and drop and resizing an item to change event duration or move to another date or time. This is one of the unique features of the Office 365 SharePoint calendar add-in. You can enable or disable data sources from the Calendar. On pics below, you can see “Leaves” are appearing in Purple color. Now when I disable “Leaves” (simply click on Leaves data source) on data source legend, the “Leaves” are automatically get hidden from the calendar. On the pic below you can see “Leaves” data source is in disabled mode. To enable it again you just need to click on that data source. You might have thinking everyone having contributed or full access will be able to edit Office 365 Calendar add-in, then where is the security? Yes, Security is there, you can set who can edit your Virto Office 365 Calendar from the Settings page of the Calendar. This is one of the best Calendars for Office 365 available which is very easy to use and also it has lots of features like the different color-coded for various data sources. You might have different SharePoint calendars or tasks lists but it is really awesome if you are getting all tasks, events, and meetings in a single calendar. This is really a very good SharePoint calendar add-in for an enterprise. You should try it once. Get more information at the site page of Office 365 Calendar Add-in.